Detroit: Become Human is a flawed, yet unique and compelling experience that players should definitely check out. Over the last decade Quantic Dream has established a unique gaming niche genre by working against the expectations of players. While many games offer their audiences power-trips, skill-based challenges and control systems that feel intuitive, Quantic Dream’ releases come across more like interactive movies than video games. Players now know what to expect in a game from the French studio; lengthy narratives that can split depending on the choices one makes, lots of quick-time-events (QTEs) and tasks that range from utterly mundane to potentially life-threatening for the characters involved. It’s an approach to game development that has yielded decidedly mixed results. The studio’s first game, Fahrenheit started off well, but descended into an ungodly mess by the end credits. The follow up, Heavy Rain, just about held together, but failed in its attempt to make players connect with its characters thanks to a silly script and a plot hole big enough to drive a bus through. The less said about the studio’s last game, Beyond: Two Souls, the better. Detroit: Become Human, Quantic Dream’s latest offering, is unarguably the best game the studio’s made. It’s not likely to win many converts and it’s far from perfect, but for the first time, the developer’s idiosyncrasies and eccentric approach work for rather than against it. The year is 2038 and advancements in AI and robotics have given rise to lifelike androids who serve their human masters as domestic assistants. This has lead to a massive rise in unemployment, sparking a lot of resentment in the USA’s human population; many shun androids outright and some are openly violent against them. The androids, for their part, are treated basically like slaves; owners ‘park’ them at shelters until they require their services and they are segregated in public transport. Most androids accept this life without question, but some have started to become self-aware and question the programming that keeps them in servitude. These ‘deviants’, as they’re known, are starting to pose very real threats to their human overlords and tensions between both camps are starting to bubble over. The game’s story is told through a trio of androids in Detroit, which is where the company that manufactures them, Cyberlife, is based. 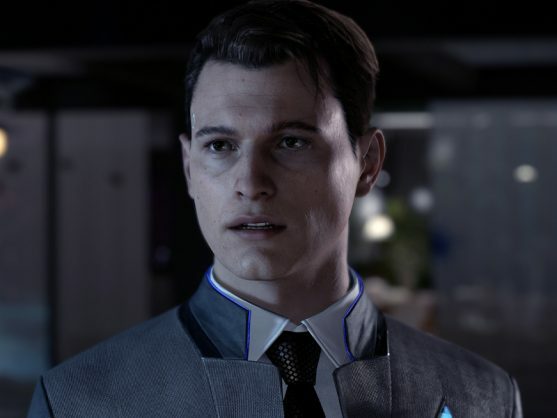 There’s Markus (Jesse Williams), an assistant to an ageing artist (Lance Henriksen), Kara (Valorie Curry) a domestic servant who cares for the daughter of an abusive father and drug addict, and Connor (Bryan Dechart) an advanced prototype android who Cyberlife has created to deal with the deviant menace. Of the three of them, the most intriguing is Connor. Unlike Markus or Kara, whose trajectory is practically dictated by events that transpire early on, Connor is a wild card; he’s an android programmed to hunt his own kind, but the deeper into his investigations he gets, the more conflicted his programming becomes. By comparison, Kara’s main aim is to keep her young charge safe is pretty straight-forward, and Markus’s moral dilemma is whether to take part in a peaceful or violent uprising is slightly dull. What gives the narrative some heft, is the fact that each of the three protagonists is vulnerable. That’s to say not all of them may make it to the end of the story, depending on the decisions the player makes. Not only that, as they progress through the game, players will find their choices (and sometimes their reaction speed) have a sizeable impact on the direction the plot heads in. For example, should Markus spare a cop guilty of mowing down fleeing androids, or end his life? Should Connor push against his programming or remain loyal to his creators? Should Kara rob a store at gunpoint to make sure she and her charge have shelter for the night? The array of decisions the player is called upon to make is staggering – Quantic Dream even goes so far as to end each chapter with a flow chart, showing players how many paths they could have taken in just a single level – and how many are still locked off. The performances are very good for the most part, with the actors elevating some truly terrible dialogue in places. Special props have to go to Clancy Brown, who plays Connor’s human partner, Lt Hank Anderson. The character is a bundle of cliches – an alcoholic, down on his luck cop who once was a decorated officer back in his heyday – and some of his story arc is borderline cringe-worthy but in Brown’s hands, he becomes pure gold. Aside from its less than impressive script, Become Human also suffers from its own heavy-handedness. There are clear lines to be drawn between the androids’ plight in the game and slaves of the past, but writer and director David Cage doesn’t really have anything new to add to the conversation civil rights movement. Similarly, Cage’s attempts to address ‘what it means to be human’ are about as subtle as battering ram, and this material has been addressed before and handled better by films like Blade Runner, Ex Machina, Ghost In The Shell and the recent Westworld series – all of which, incidentally, are sources that Become Human borrows liberally from. In spite of its shortcomings, though, Detroit: Become Human manages to hold together. While its possible to pick holes in both its plot and its world, the game is a unique and, at times, a compelling experience. Quantic Dream hasn’t perfected its niche game genre yet, but Become Human comes very close, making the French studio one to keep an eye on in the future. And yes, if you own a PS4, this is very well worth buying, even if you couldn’t call it a system-seller on its own merits. Detroit: Become Human was reviewed on a PS4. Review code was provided by the publisher.